Structured Products II- Good or Bad? It Depends on Your “View”. An earlier blog provided an overview of Structured Products . As a specific structured product application consider an enhanced index product with six year maturity whose payback is 1.45x the reference price index return in local currency (without dividends),when it is positive, ; and 1x the index when negative. Let’s also assume that the reference index is represented 50% by the S&P 500 return and 50% of the MSCI EAFE return. Before one can express a view as to what the market value of the index might be in six years, let’s look at the historical annual returns of the component indexes, which you can find at MSCI Barra with dividends (total return net of withholding) and without (price only) dividends. Therefore, the dividend component of the S&P 500 and MSCI EAFE returns added annually about 2.5% and 2.3% to the price only return of the respective indexes. So let’s assume that for the reference index over the next six years, dividends will add an annual 2% to price returns (since currently dividends are lower than historical numbers), and since dividends have started to rise recently, this may be too conservative for the next six years. Similarly, given that price only returns were much higher the past four years than the past 38 years and thus we may expect some reversion to the mean over the next six years, so it may be quite aggressive to assume an average price return of 7% per year over the next six years, but will do so anyways for this example. Of course, you’ll have to select the probability of returns associated with the reference price index and you could do the calculation for your assumptions. Then we could generate the following view of the outcome of investing in such an enhanced index Structured Product as compared to the other options for a given probability distribution of price returns. Using the probabilities for maturity values of the reference index, we can compare the expected value of a $50 initial investment in the Structured Product described above and compare it to a 50:50 Bond:Index mix or a 100% investment in the reference index. 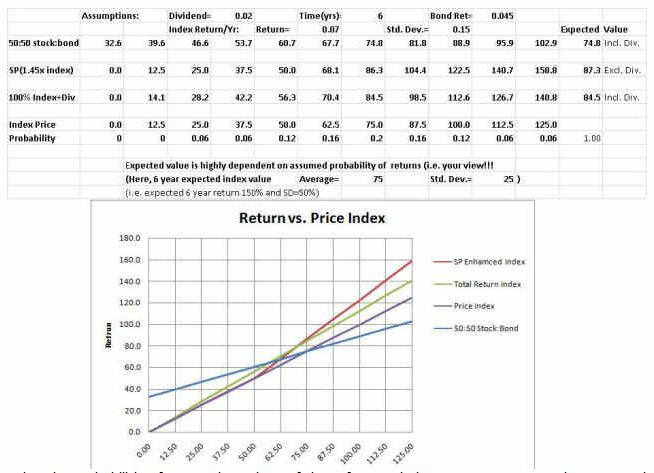 With these probabilities, the above table shows that the expected values of the Structured Product ($87) and exceeds the 50:50 asset mix ($75) significantly, but the 50:50 mix gives you more downside protection if the actual outcome is much lower than the expected index of about $75; the 100% reference index investment has a slightly lower value ($84), but also has no downside protection. So it comes down to your “view” for probability distribution of the reference index and your sensitivity to the disadvantages identified in the above table. Based on that view and its corresponding expected value at maturity, you may decide that the disadvantages are worth the payoff; otherwise you may be better off with the 50:50 mix. So it’s a pretty complicated analysis, and you may want the issuer to provide you with detailed scenario analysis and you may want to discuss such an investment with your trusted advisor. In the next blog on Structured Products, I will discuss how to make your own by using derivatives, in Create Your Own Enhanced Index Structured Product .